i think this should work very well =) whats your opinion? I don't think it is a good idea to have your side surrounds in front of the seating position. The effects will be way out of wack. Bullets, bombs, etc. will be in front of you when they are supposed to be to the sides. I would seriously re think the positions of your surrounds. Sectional sofas are usually a challenge. If there is room, I'd move the sofa(s) forward and to the right. Locate the left surround on the wall at the seated distance and the right one on a stand at the same distance. Our living room was also a horror story for audio. I would consider in or on the wall speakers for the front effects to give a better sound field. I had the opposite occur, I thought the M-L in walls would be my mains but I wasn't happy with the sound. I added a pair of Heresy's as the Main R&L and the M-Ls are now the Front Effects. The spatial presentation is much improved and setting the Receiver x-over points eliminated distortion I was getting from the M-Ls. Theoretically i can switch the 150s and the r14s ? If you want it to sound right, put that TV on the wall on the left and put the couch in front of the pillar facing to the left. Otherwise let your girlfriend design it. If you want it to sound right, put that TV on the wall on the left and put the couch in front of the pillar facing to the left. Sounds like the trickiest dilemma is maximizing the sound coming from your speakers while minimizing the sound coming from your girlfriend. Try to find a happy medium so that all will enjoy the experience. You have to be sneaky about this. Tell her "The Notebook" will have a much greater emotional impact if you move the couch to set it up right. I agree, if not the sound will always be unbalanced due to the left wall and open space on the right. 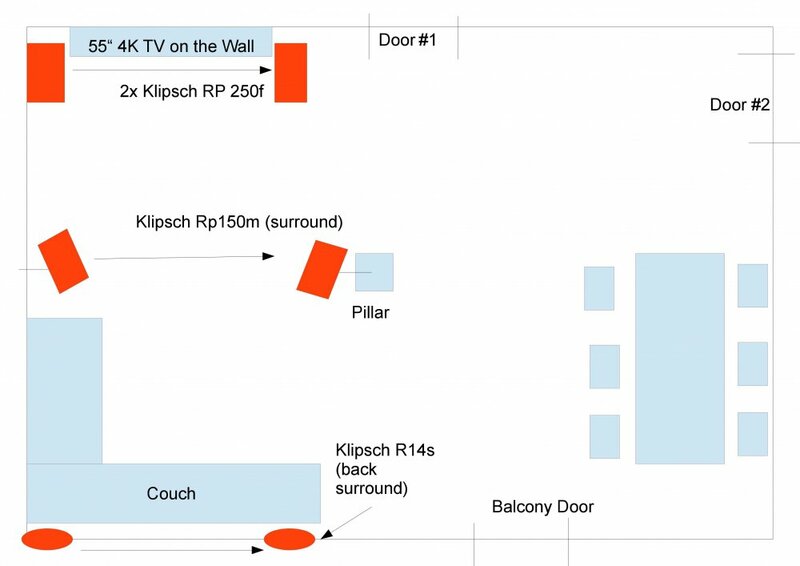 I would go with the way MetroLakeOutfitters outlined it and put the R-14 s speakers on the 'top' and 'bottom' walls by the balcony door and the Door #1. You can use your AVR to correct the distances and I personally like my surround speakers further away. For this setup, I would not worry about going 7.1 unless you wanted to run rear surrounds on the 'right' wall but you are already on thin ice moving the couch and good luck convincing your girl to let you mount more speakers above the table across the room. If it's her place I understand, if it's both of yours, it's time to talk, both of you should be happy, thought that's how it worked anyway. Just tell her you need to talk about unreasonable amounts of shoes and clothes. Good luck, your are not the first one in this predicament by far, someone long ago misled women into thinking they always make the only rules, fair or not. That's why the title is: "She who must be obeyed"
Hope I didn't get you in trouble, there is a fine line between getting what you want and also being able to live with those decisions, and repercussions. Sounds like you did good, must have prior experience. Hope you are both happy in the end.